Zenport Industries is a worldwide leader in the manufacturing and marketing of professional and consumer specialty horticulture tools and supplies for the lawn and garden, landscape, irrigation and agriculture markets. Zenport products are available worldwide via our retail and distributor networks. Zenport has remained faithful in its commitment to continuous quality improvement in design, development, and engineering. Today, Zenport Industries is divided into three unique product divisions: Zenport Specialty Horticulture Tools & Supplies, Zen-Tek Instruments and Zen-Tek Safety. Zenport manufactures a complete line of vineyard harvest and maintenance tools. These include pruning equipment for the vines - both manual hand-pruners and electric vine pruners. Vine loppers for vine pruning. Grape hook knives and grape harvest shears for both wine grapes and table grapes. Tape and tie tools to secure the vines to the trellis wire. (We will be debuting our newest electric tapener tie tool very soon.) A variety of styles of grape thinning shears in both high-carbon steel blades and stainless steel blades. Curved or straight blade thinning shears. We stock 9 different styles of the popular Swiss style forged aluminum professional grade hand-pruners at a significant wholesale discount with no minimum order required. Zenport stocks 10 different sizes of the popular ring/twine knives for cutting tape and twine. We are currently the only authorized manufacturer of the new Grape Harvest Safety Razor (H335). Zenport EP108 CORDLESS ePruner .5-inch Cut Battery Powered Electric Pruner. Features 2 powerful 4-hour, 2.5Ah 14.4V lithium-ion batteries. Full battery charge will complete 4,000 continuous pruning cuts. This pruner is super light weighing in at 1.5-pounds/0.5kg. The razor sharp cutting blade is made of high quality SK5 Japanese steel. Maximum cutting capacity of .5-inches/15mm. Impact resistant carrying case keeps the tool and accessories safe and secure while storing or travelling to the job. Portable maintenance tool box helps keep this electric pruner operating at optimal performance for many years. Contact Steve or Randy for more information. At Zenport, we offer a full line of professional vineyard industry tools for pruning and maintaining properly cared for grape vines. We offer full warranty coverage, service and parts on all of our electric pruming tools. Featured at the Unified Wine & Grape Symposium, Steve demonstrates how to use the electric puring shears. Zenport manufactures a complete line of vineyard harvest and maintenance tools. These include pruning equipment for the vines - both manual hand-pruners and electric vine pruners, vine loppers for vine pruning, grape hook knives and grape harvest shears for both wine grapes and table grapes, tape and tie tools to secure the vines to the trellis wire. 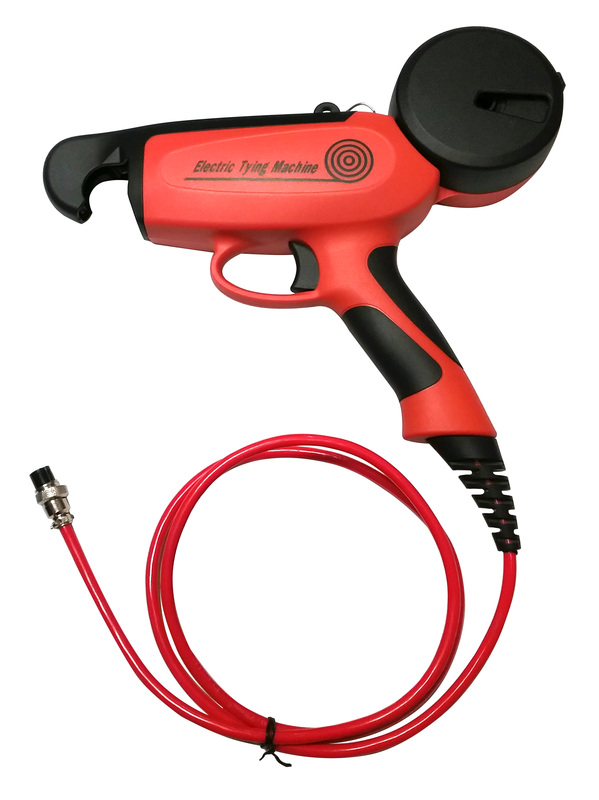 (We will be debuting our newest electric tapener tie tool very soon). We also have a variety of styles of grape thinning shears in both high-carbon steel blades and stainless steel blades. Curved or straight blade thinning shears. Zenport will be displaying our full line of professional vineyard industry tools for pruning and maintaining properly cared for grape vines. Please stop by our booth 2305 at the Unified Wine & Grape Symposium to view our portable electric pruning systems for vineyards, orchards and other specialty horticulture tools. Zenport offers full warranty coverage, service and parts on all of our electric pruning tools. We look forward to meeting you at the Unified Wine Symposium trade show. Ask for Randy or Steve and we will be glad to assist you. • Tying plants to support stakes & lines. • Saves time and provides a secure plant tie. Zenport Industries products are available from authorized Zenport product dealers. For the name and location of the nearest Zenport dealer in your area, please contact Randy at 503-524-7289 or Steve at 503-473-5908.